Everybody who’s been travelling solo for a while remembers their first solo trip, probably because the emotions were just more intense. It’s like the traveller’s version of losing your virginity. You don’t forget the first one! Many of you know my story already, so today I thought I’d give you six other stories, from six different people, who all started travelling solo at some point in their lives, for various reasons. In true BigTravelNut style, I wanted the post to be honest and genuine, so I asked the participants to share both the positive and negative aspects of their experience. I expected to find the stories inspiring, but I have to say, I did not expect to find them so entertaining. 🙂 I hope they encourage all of you out there who are thinking of taking the plunge and travelling solo, to go for it and follow your dreams! 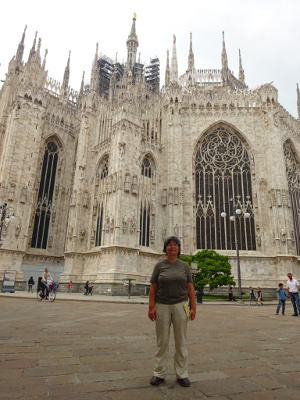 I went on my first international solo trip to Italy at the age of 60. I spent one week in Milan in a private home that I found through AirBnB. The second week, I went to Costigliole D’Asti where I attended my friends’ wedding. The wedding was the great reason to go to Italy, a place I never thought of visiting before, and since I had no one to go with, I went alone. Before the trip, I spent lots of time on the internet planning my stay in Milan. I wanted to have a plan, a list of things to see and do. Really, it was a waste of time. Milan is packed in the summer, and riding the public transit was confusing. I found it much more enjoyable and relaxing when I decided to get on and off whenever I saw an area that seemed interesting. I saw places I never would have seen otherwise. I also planned to go to Lake Como, and following my host directions, I made my way there with no problems. The second week I was off to my friends’ wedding. I had to go back to Milan Airport to get my rental car. Oh my God, I was totally confused! I managed to get out of the airport, and spent 30 minutes trying to figure out the GPS. In the end though, I had a picturesque drive through Italy’s countryside. In Costigliole D’Asti, I stayed at a small B&B.The food, room, everything was perfect. The next day I had car problems, and the owners helped me get the car serviced. Without their help, I would have missed all the pre-wedding events. Their kindness will never be forgotten. The big takeaway from the trip is that nothing you read can really prepare you. The only thing you can expect is the unexpected, both the good and the bad. I did find traveling alone in a country where I did not speak the language frustrating. Still, going solo was very freeing. Metaphorically paralysed by a bitterly lonely and cold winter, I felt I was too young to grow old and dying to live, so in a moment of madness, I found a tenant for my house, booked all of my flights, a few cheap places to stay through Airbnb, Hostelworld or Booking.com and that was that. I was on my way to the fabled city of Oaxaca and the Pacific beaches of Mexico, Bogota, Cartagena and the Caribbean beaches of Colombia, the paradise that is Costa Rica, and just for the hell of it, New York City on the way back. I hadn’t even bothered to ask if anyone wanted to come with me – how often do we wait for the right time, only to wait forever. Travelling solo aged 54 shouldn’t be different from travelling solo at half that age, except it is. Fitting a 4-month supply of vitamins, lotions, potions and god knows what else (stove top coffee pot for one) into a backpack was never going to work, plus I wasn’t interested in travelling light. Consequently, my bag weighed a ton. I wasn’t worried about climbing a cliff with no water, going on a death-defying motorbike ride, or getting caught up in a riptide; what I was worried about was getting my enormous bag up a flight of stairs. I needn’t have worried. People everywhere were helpful and constantly intrigued as to what I was doing. Any woman travelling alone is unusual, especially in Mexico and Colombia – two of the most dangerous places on Earth. In fact, being alone gave me the freedom to do exactly what I wanted and to challenge myself in every way, every day. It was the most exciting and rewarding time of my life and anyone can do it! It was 1984; I was 26. I had been to Europe two summers before, traveling with friends, but on my own at times. I was a little apprehensive about going on my own, but I really wanted to go. I forced myself into going by telling friends and family about my trip before I had really convinced myself, so I would have to follow through or lose face! I started in Mexico City, where the airline lost my luggage. I learned Spanish by calling the airline and repeating “Donde esta mi bolsa?” for four days until they found it. I traveled through Mexico, Belize, and Guatemala by bus and train, staying in hostels, where I met up with other young travellers. Three of us left Belize in a hurry when the only hotel in the capital wanted $6/night each, and we felt that was outrageous! From Guatemala I flew to Costa Rica (skipping some unsettled countries), and then to Quito, Ecuador. I met an Israeli restaurant owner with connections. After a conversation in fragments of English, Spanish and Hebrew, I had an Israeli student card and a free flight out to the Galapagos Islands on an Air Force plane. From Ecuador I went to Peru, where I found a note at the American Express office (no email back then) saying my father was ill. I ended my trip to come home after three months. I was rarely alone, joining up with travellers from many countries and often running into the same people later on my trip. I guess they were all following along in Lonely Planet’s South America on a Shoestring. This trip gave me the confidence to travel on my own, and helped me learn about other countries and cultures. Prior to my first solo trip, I meticulously organized my travel details and stuffed my backpack full. No way was I going to miss a flight or forget something! 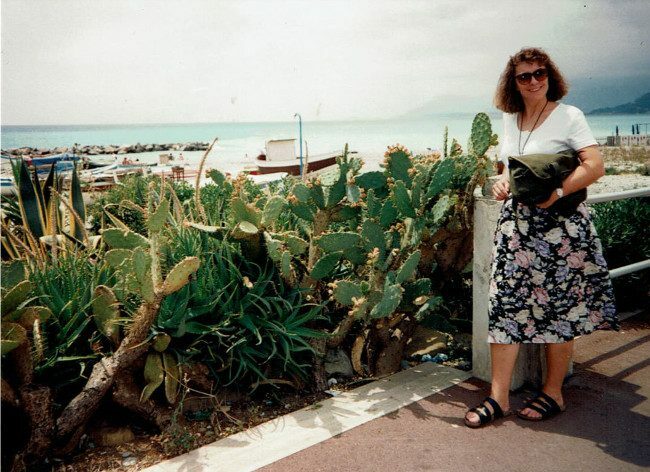 It was 1992, I was 31 years old, and I was off to visit family in the Netherlands before attending a month-long French Immersion program in Nice. Afterwards, my husband and I planned to spend two weeks backpacking in the south of France. After a short flight to Toronto, I placed my carry-on in the top of a luggage cart, heaved my backpack off the carousel onto the bottom, and made my way through the crowded terminal. It was only when I got to the check-in line that I realized my backpack was gone! I panicked and burst into tears. Other travellers and the airport police tried to help, searching and inquiring. Moments before boarding, I again retraced my steps. There was the backpack, behind a stack of bags, right by the luggage carousel! Back at the check-in counter, I was told it would go to Amsterdam, but on a later flight. Fast forward six weeks. I’d learned about my family’s Dutch heritage, honed my second-language skills and explored Provence and the French Riviera. But, back in Toronto, my backpack and I were separated once again, this time due to an over-zealous airport security officer who had detained us on our way home. “I was here six weeks ago, at the start of my trip!” I complained while again filling out paperwork at the Luggage Claim desk. “Yes, I remember you very well!” the clerk replied. No wonder. My excitement, inattention and very public meltdown had almost ruined everything. Since then, I try to slow down, stay calm, and lighten my load. Better for travel and for life, in general! 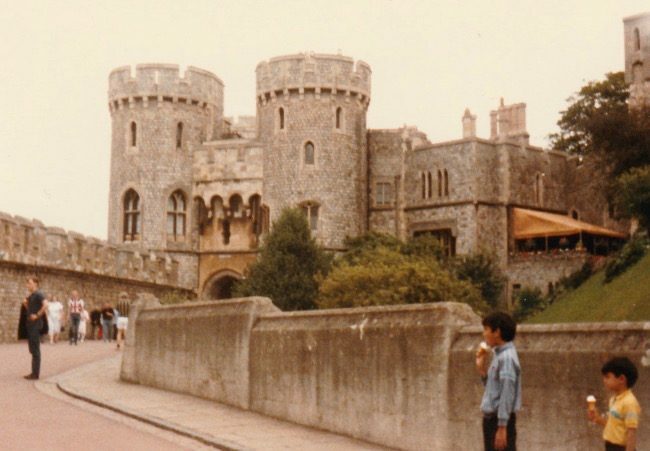 When I was 24 years old I lived and worked in London, England with a group called SWAP (Student Work Abroad Program) which was run through universities all over Canada. I then spent a few weeks travelling through Scotland, France, Belgium, and The Netherlands. I spent two months in London working at a few office jobs and shared a flat with four other Canadian students. I then took a 4-day tour to Scotland where I shared a room at a hotel with a fellow from Quebec. After that, I took the ferry to the continent, and then travelled by train through Paris, Brussels, and Amsterdam. In Paris, I stayed with a friend’s grandmother and at my brother in law’s former studio. In Brussels I stayed at a budget hotel, and in Amsterdam I stayed at a youth hostel. I decided to go solo because I had no one to travel with. There was no way that I was going to let that stop me. I wanted to realize my dream of going to Europe. My main concerns were not being able to get a job with the unemployment rate being so high in Europe and thus not having enough money to be able to stay there. There were a few negative experiences. I had some difficulty finding full time jobs in London. There were problems with the landlord when we broke the lease. And then in Amsterdam, my bag was taken along with the luggage from a tour group from Spain just before I was supposed to head back to London. All in all, it was a fascinating experience. I learned a lot about travelling and it enabled me to broaden my horizons. I was 52 years old when I finally took the plunge and ventured on my first solo volunteering mission, something I’d only ever dreamed of doing. 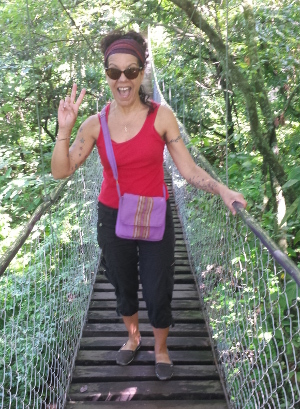 The mission was for three weeks and would see me in Costa Rica, a place I’d never been to, and whose language (Spanish) I couldn’t speak at all!! I was terrified, excited, nervous and continually wondering what on Earth I was doing, as I had never ventured out on my own like this before, especially not to a poor area. The culture shock was mind blowing and I found myself crying a lot because of the poverty I saw. I wasn’t prepared for that. Suddenly, all the silly problems I had been whining about most of my life were trivial and meaningless. I stayed with a host family and communication was next to impossible because of the language barrier. My volunteer guide, however, did speak English and helped whenever he was available. The mission itself was, ironically enough, teaching English to some women who ran a nursery (plants not babies)! This trip changed my life forever and opened my eyes to a world that obviously was in need of healers, helpers, and lovers. Upon returning to Canada, I worked on becoming a freelance writer, retired from my salon job, sold all my stuff and within a year I was back down in Central America, this time Guatemala, to help save the world and stop malnutrition, one hungry belly at a time. I hope you enjoyed these stories. There are as many reasons to travel solo as there are people, and as you saw, the metaphorical ride can sometimes be bumpy. But in the end, everybody overcame their problems and ended up having a good time and learning a lot. Perfect trips are rare, and what determines how much you enjoy your experience is how you handle those issues without freaking out. The good news is that the more you travel on your own, the more confident and self-reliant you become. I found it interesting that four out of my six contributors had luggage issues! What are the odds? But then I remembered that I too had problems with my luggage on my first solo trip. I brought a suitcase with no wheels! It wasn’t really big, but I couldn’t walk very far carrying it without risking dislocating a shoulder. On my second solo trip, I started using a backpack and carrying a lot less stuff. Overpacking and not watching over your bags like a hawk seems a common culprit of first-time solo travellers. Here are my tips for packing light if you’re curious. 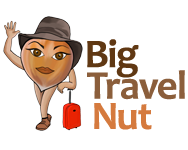 Note: By the way, if you’re a BigTravelNut reader and haven’t filled up my survey yet, you can still do so here. It will help me know you better and give you more of what you want, and should only take a few minutes. Thanks! Lots of great stories that I could certainly relate to. Thank you for publishing my story and hope it inspires others to travel. I too am in the process of learning not to freak out when in a difficult situation. One of the toughest things I find is the language barriers sometimes but I somehow manage to get around that. Yes, the language barrier can be frustrating at times, but rarely insurmountable. I smile when I think back to that homestay in Zagreb where the landlady spent a good 10 minutes explaining how everything worked in Croatian, even though it was clear I didn’t speak the language beyong “hello”. Ha ha ha! But somehow I understood everything she meant. I love sharing travel stories and it seems that there is never a shortage of them. As others have pointed out to me, if things didn’t go wrong when we travelled, we wouldn’t have any stories to tell afterwards! In my experience, the rewards almost always far outweigh the risks. I would encourage others to take the leap and travel solo when you can. Thank you to Marie for giving me the opportunity to share one of my stories here. Loved reading those experiences. Mine mirrors theirs as well. I’m glad to hear this Monique. This encourages me to publish more stories, both mine and others’. Big Travel Nut recently posted…What to do in Montreal this summer – its 375th! 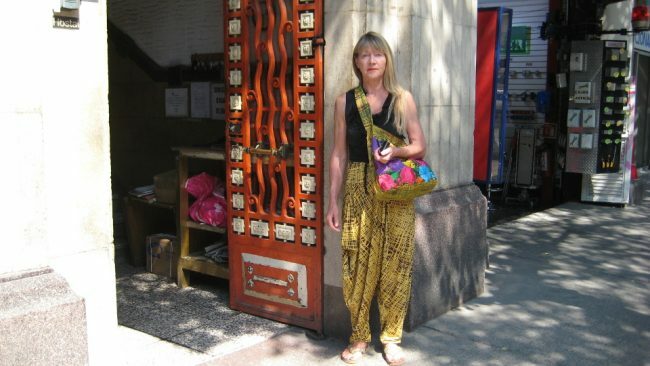 What a great collection of solo travel stories. There was something in each one that I could relate to, from my first solo trip and all the rest that have followed. Thank you to everyone for sharing their tale! I love traveling and I used to travel alone. It actually feels good. I’m from Delhi basically, I visited Jaipur alone for the first time when I was just 16. It was a great experience as I got to know their culture and had the best authentic food.